Track work and reconstruction will affect five of the six Metro lines this weekend. The Green Line will provide regular weekend service, but all other lines will run on amended schedules. Yellow Line trains will run every 15 minutes between Huntington and Mt. Vernon Square stations on Saturday. On Sunday, Yellow Line trains will run every 15 minutes between Huntington and Fort Totten stations. Buses will replace Orange Line trains between Eastern Market and New Carrollton. 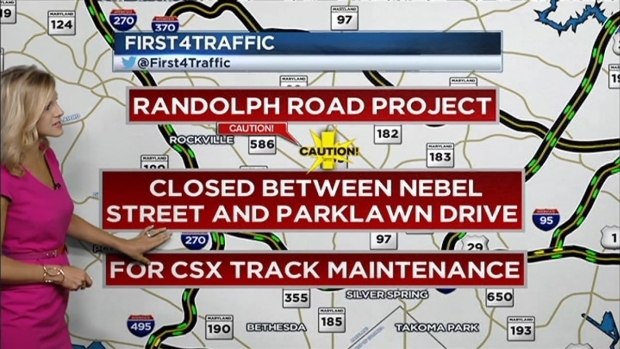 Randolph Road in Rockville will be closed for a week as CSX does track work. The closure will stop traffic on Randolph Road between Nebel Street and Parklawn Drive from July 18 through July 24. First4 Traffic's Melissa Mollet reports. Silver Line trains will run every 15 minutes between Wiehle-Reston East and Eastern Market, and every 16 minutes between Benning Road and Largo stations. Buses will replace Blue and Silver Line trains between Eastern Market and Benning Road. Red Line and Blue Line trains will run every 15 minutes all weekend. Follow @First4Traffic for updates. Find more WMATA information here.